Blogging is an excellent way, and a personal one at that, of sharing one’s views and passion about any topic. Incidentally, it has also developed into a legit means of making money. And while it can be said that the blogging ‘culture’ exploded about half a decade ago in the Indian metros, Goa has finally woken up to this phenomenon and the rising number of bloggers is a testament to this. While the top bloggers in India across multiple genres and niches have done well to prove that bloggers in India can make substantial income via blogging alone, to be able to do that, however, is no cakewalk. From setting up a blog on WordPress, to working on the design and maintenance of the blog, to then promoting it and reaching out to the target audience through social media and other channels, there’s a lot that goes behind the glamour and luxury that usually hogs the limelight and makes blogging look ‘easy’. 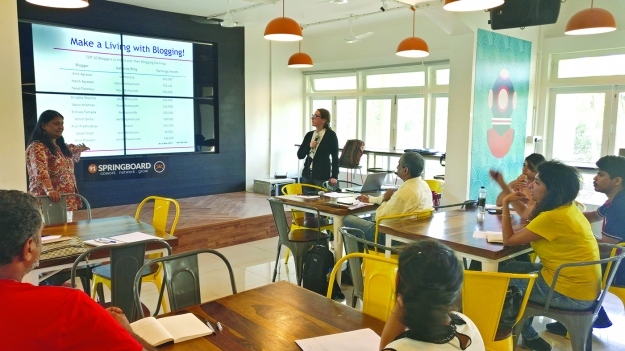 To educate the blogger community in Goa on the dos and don’ts and the basics of blogging, IndiTales and MasalaHerb, two of India’s well-established blogs, in association with Goa’s biggest co-working space, 91 Springboard recently held a professional blogging workshop in Panjim. The workshop was aimed at helping new bloggers start their journey as a professional blogger and educate them on ways to monetise the blog. For Helene D’Souza, MasalaHerb.com was an outlet to share and exchange knowledge with others online on a global scale because she saw a potential in succeeding as a professional blogger. Since then, Helene has been writing extensively about food, with a little bit of travel thrown in. An Austrian national, Helene made Goa her home a few years ago and has been sharing recipes of delicious food from Europe and Asia, and that also includes the rich, aromatic and diverse side of Goan cuisine. Anuradha Goyal, on the other hand, is one of the early birds who took to blogging years before it became ‘fashionable’. After starting IndiTales in 2004, today, Goyal is among India’s top travel bloggers and has travelled to 15 countries and nook and corners of India. The workshop had the duo talk about how to successfully start a blog from scratch. The participants were given a chance to learn the confusing world of blogging in a straight forward manner, while Helene and Anuradha guided them and answered their questions whilst sharing their experience. The workshop also gave the audience an opportunity to look at the different platforms. In a nutshell, the workshop covered some of the technical points, and key aspects that influence the organic reach of the blog, such as search engine optimisation and social media.